Last offseason, the Giants attempted to improve their linebacker position via trade. 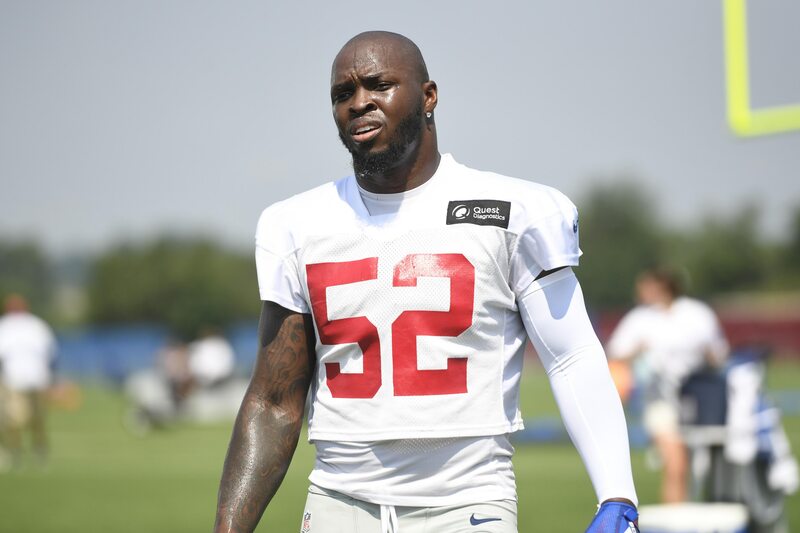 The Giants acquired Alec Ogletree and a 2019 7th round pick from the Los Angeles Rams in exchange for a 2018 4th round pick and a 2018 6th round pick. Despite this trade, the Giants’ linebacker position was still below average in 2018. Alec Ogletree finished the season with a 50.7 overall grade, ranked 81st out of all linebackers in the league. He was inconsistent in coverage and missed many tackles that left fans frustrated with the defensive captain. B.J. Goodson performed better (66.2 overall PFF grade), but was still only the 41st ranked linebacker in the NFL. Luckily for the Giants, there are plenty of options to upgrade the linebacker position in the 2019 offseason. There are options in the 2019 free agency class. The Giants can certainly find quality linebackers to start for 2019 and beyond. If the Giants want to make a splash in free agency, there are a couple of big-name free agents they could look to sign. However, it does not stop there. There are not only big-name free agents, there are solid depth pieces they could look to sign on cheaper contracts. One big-name linebacker they could sign is Anthony Barr from the Minnesota Vikings. Barr is a jack-of-all-traits. He can rush the passer, defend the run, and play in coverage. Anthony Barr has been selected to the Pro Bowl each of the past four seasons. However, it would not be surprising if Barr remained at linebacker because of his ability to play in coverage. His 22 total passes defended in only 5 seasons proves he is a playmaker at the linebacker position. He had a down year in 2018. He posted a career worst tackle total with only 55 but that could work to the Giants’ benefit. His 2018 campaign could lead him to a lower market value this offseason. If Barr could return to form, he could take the Giants’ defense to the next level. Jordan Hicks is another big-name free agent that the Giants could look to sign. Stealing an impact player from a division rival could reap plenty of benefits. He could give the Giants some insider info on how to beat the Eagles’ defense. On top of that, Hicks is one of the best coverage linebackers in the NFL. He had 5 passes defended in 2018. After missing 9 games in 2017 with a leg injury, Hicks bounced back with a solid campaign in 2018. In only 12 games, Hicks posted 91 total tackles. Hicks also totaled 3 sacks and one fumble recovery. Hicks was still working his way back from injury in 2018, but if he is completely healthy in 2019, he could return to form as one of the best linebackers in the NFL. In 2016, Hicks played all 16 games and was lockdown in coverage. He had 5 interceptions and 11 passes defended in 2016. The Giants’ defense would welcome that production with open arms. Deone Bucannon from the Arizona Cardinals is not a top-tier, big name free agent. He should be a cheaper option in free agency, but he could very well be a match for the Giants. Bucannon has a connection to the Giants’ defensive coordinator, James Bettcher. Bettcher was the defensive coordinator of the Cardinals before he joined the Giants in 2018. Bucannon used to play safety for the Cardinals, but Bettcher had the wits to convert him to linebacker because of his tackling ability. In 2015, when Bucannon was playing both safety and linebacker, he racked up 109 tackles. He also had an interception, 3 passes defended, and 3 forced fumbles. Unfortunately, Deone’s production has not been as stellar as 2015 in recent years. In 2018, Bucannon only started in 6 games, played in 13, and racked up just 38 tackles. He has become more of a rotational player. However, it is possible that a reunion with Bettcher could bring out the best in Bucannon.